Valmont Unit 1 went into service in 1924 and three more units were added in ensuing years through 1942. 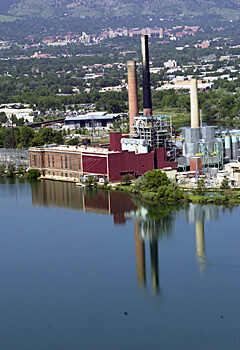 At one time, Valmont was the largest power station west of the Missouri River and it remained the company’s largest Colorado generating station for several decades. The four oldest units stopped generating power in 1986. Unit 5 uses three surrounding reservoirs for circulating cooling water. These reservoirs attract an array of wildlife, including an abundance of waterfowl. For decades the plant site has been recognized as a unique wildlife refuge. From January through early spring, great horned owls use a nest box located on one of the plant’s three stacks. A camera installed in the box enables the public to watch nesting activities and learn more about the owls on Xcel Energy’s Owl Cam, available at xcelenergy.com. Unit 5 will be shut down in 2017 as a result of the Colorado Clean Air – Clean Jobs Act, supported by Xcel Energy. This Act requires regulated utilities like Xcel Energy to reduce emissions from coal-fired power plants. Unit 6, a natural gas combustion turbine, will remain in service. Valmont Station strives to be a responsible neighbor and steward of the special habitat that surrounds the plant. Employees support a number of community organizations and projects, including a yearly golf tournament that helps raise money for local charities. Employees also helped develop a tree trail at the plant entrance to educate visitors, which features about 20 types of trees that grow well in the region. We also work with local community groups and have hosted a number of events, including special plant tours and yearly bird counts.